What are the main elements of the Dalkeith THI and CARS? strengthen and enhance the character of the historic High Street. create a more pedestrian friendly environment that also allows vehicle circulation. improve links through the vennels and the lanes. upgrade key properties along the High Street. develop education and training initiatives. What are the main aims of the Dalkeith THI and CARS? To repair and promote the occupation of historic buildings. 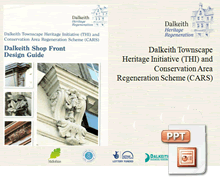 To preserve and enhance the character of Dalkeith. To improve the public spaces and the street scene. To involve the local community and improve knowledge about the historic environment. 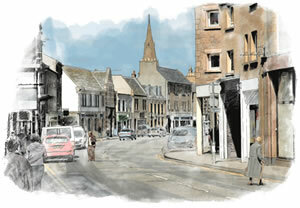 To restore Dalkeith to a prosperous market town. To encourage additional investment in the town centre. To ensure that the project is sustainable and provides a long term solution for Dalkeith.